At KCC Service and Maintenance we are committed to Total Customer Care. Operating safely at all times, our goal is be a real performance partner to you, our customer, offering maximum operational availability and efficiency for your equipment. Our proactive maintenance programmes are based on equipment usage, allowing you to control your maintenance budget while increasing equipment reliability and reducing life cycle costs. This is the most economic way to obtain optimal profits from your equipment as it reduces the risk of incorrect performance, malfunctions and downtime. Our current service portfolio highlights our expertise and diversity across all sectors: Healthcare, Education, Pharmaceutical, Logistics, Retail, Stadia, Business and Industry. How costly is downtime to your business? 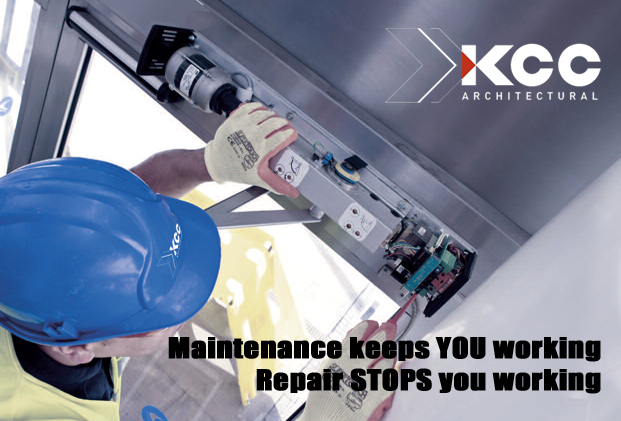 At KCC Architectural we believe that the best way of taking care of your interest is by working safely and taking the best care of your equipment. We pride ourselves with providing the highest quality of service and compliance. Operating nationwide, our team of service engineers are fully trained to ADSA and EN16005 standards to offer complete service and maintenance packages that ensure your peace of mind. With entry and egress points being the busiest area in your building, the continued operation of your products is vital. Regular service over the lifetime of your equipment ensures reliability, optimum performance and minimizes your liability to risk. KCC offer a full range of Service and Maintenance Agreements for all makes of automatic doors and access control systems, tailored to suit your individual needs and budgets. We carry out performance checks and provide documentation, reports, and recommendations with every visit to assure your door system operates as designed and meets regulatory requirements. We also offer a 24/7 service to all of our customers with service agreements. KCC can undertake door surveys to ensure your building is fully compliant with all fire legislation. We asset tag each individual door and issue a report and recommendations based on our findings. Avail of this offer now by contacting us and scheduling your survey.